Some guys have all the fun, as the title of the recent, massive aural history of ESPN makes clear. George Bodenheimer was one of those guys. He started off as a gofer and driver in ESPN’s earliest days, rose through the ranks from affiliate sales, and eventually ran the whole shebang. 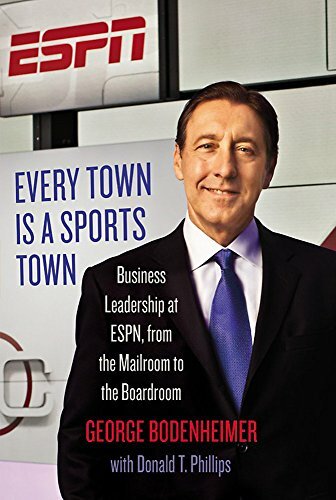 Every Town Is a Sports Town is Bodenheimer’s memoir/business book about his time at the self-styled, and accurately so, Worldwide Leader In Sports. Everybody takes ESPN for granted today—it’s just a part of conversation in society. But there was a time when the network consisted of a few trailers and a few dozen young people who loved sports and thought that cable TV had a future. Not everyone felt that way, and getting the network off the ground was no small or easy feat. Before long, the stars aligned, and ESPN grew from a fairly simple affair to the multi-platform behemoth that we know today. Bodenheimer’s book is an enjoyable, wistful, and occasionally emotional look at the network where he has worked for 30 years. His love for his employer and his fellow employees is evident on every page. The book does contain many business lessons, but I’m not sure that it could really be called a business book. Bodenheimer is occasionally prescriptive, but most of the time he’s telling stories. The stories are fun and engaging, and the book is nicely organized and easy to read. Bodenheimer is a diplomat, which undoubtedly helped grow his career at ESPN, but certainly causes him to draw a curtain around some of the more unseemly bits of political infighting at the network, which you can read about in greater depth in Some Guys Have All the Fun. At one point, Bodenheimer explains that a movie about Bobby Knight was presented on ESPN with all 31 F-bombs included, and on ESPN2 at the same time, for family audiences. Every Town Is a Sports Town is the ESPN2 version—it’s the same story that you find in Some Guys Have All the Fun, but with the expletives deleted. It’s hardly a whitewash. Bodenheimer barely conceals his disdain for Keith Olbermann, who commits the cardinal sin of putting his ego ahead of the needs of the company. He also tells the story of firing Steve Phillips, the New York Mets general manager turned ESPN on-air commentator, who violated his marriage vows with a young ESPN intern. So no one can accuse Bodenheimer of pulling his punches. The book is just fun to read. You get to live vicariously through Bodenheimer’s experiences negotiating for rights to the NFL, the NBA, the World Cup, the Masters, and very likely the tiddlywinks competition down the block from where you live. The book is certainly more compact than Some Guys Have All the Fun, which is yet another argument in its favor. You get the entire history of ESPN without having to risk straining your obliques carrying a very heavy book around. Reading the book is a lot like watching ESPN—it’s a pleasurable experience, but not necessarily the deepest you’ll have all day. Still, it’s a good read. I’m assuming the publisher is thinking, “We can sell this book to sports fans and business book readers and people who like memoirs.” I hope they do.